Jumping the Shark With Green Jeter - who is nicka smith? This is the first of several posts discussing the second season of the Dr. Henry Louis Gates’ series, Finding Your Roots, airing September 23-November 25, 2014 on PBS. 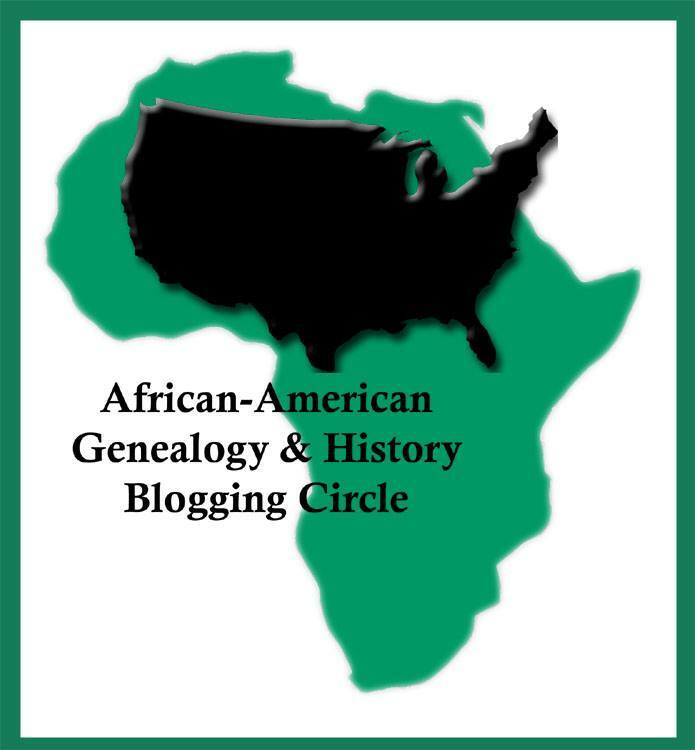 These posts are part of the African American Genealogy and History Blogging Circle. 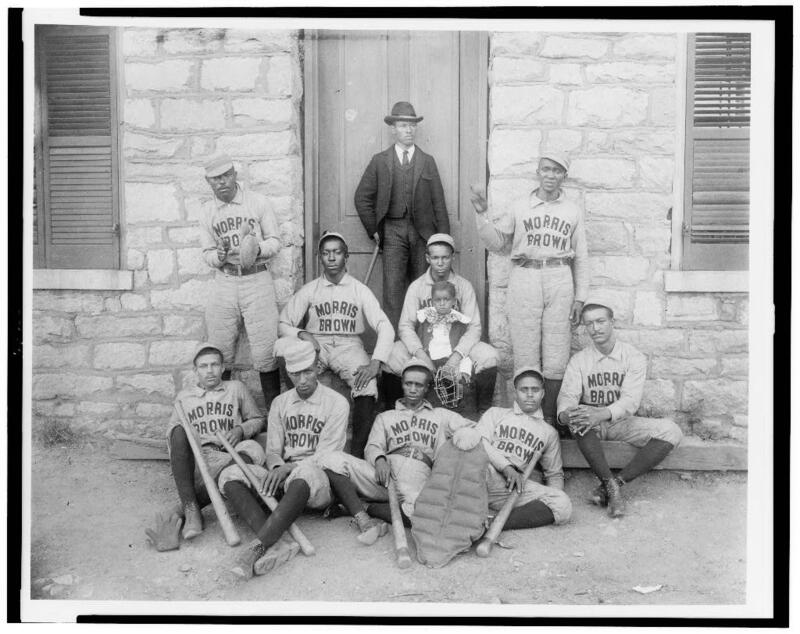 Featured Image: “African American baseball players from Morris Brown College, with boy and another man standing at door, Atlanta, Georgia,” Library of Congress. The second season of Finding Your Roots started off with a bang with the episode, “In Search of Our Fathers.” This episode detailed the ancestries of author Stephen King, actor Courtney Vance, and actress Gloria Reuben. The paternal lineage of all the guests held a large amount of mystery due to desertion, foster care, and advanced age at birth. Considering that a record number of single parent households exist in the United States (which recently also includes an uptick in households headed by single parent fathers), this phenomena is not altogether unusual, especially for the younger generation. Something more interesting, and more relatable to African American genealogy, was featured in episode two titled “Born Champions.” This episode featured recently retired New York Yankees superstar Derek Jeter, tennis champion Billie Jean King, and basketball star Rebecca Lobo. Jeter is of bi-racial ancestry; his father identifies as African American and his mother is of European descent. During the setup leading to the presentation of documents on one of Jeter’s former enslaved ancestors, the voice over by Dr. Gates stated that slaves were “nameless before the law” because they were considered property. I have to admit that this incensed me to the nth degree. Seeing as though there are probably a set of writers for the show who may not be as educated in genealogy or family history when they write for the show, I can’t attribute blame to Dr. Gates or even the researchers behind the scenes for this statement. On the other hand, considering that this is entertainment, the statement may have been made to keep the viewers attention. Despite that, the statement is not entirely truthful and is extremely misleading, especially for new researchers. There have been several cases, some even presented on previous episodes of the same show, that have shown that the formerly enslaved were not “nameless before the law.” Yes, slaves were considered property. On the other hand, in order to correctly identify the property being conveyed, gifted, auctioned, etc., one would have to denote something identifiable about it so that all parties were protected if fraud or something else transpired involving it. I hate to take it here, but I will. I wouldn’t list a car being sold on Craig’s List without the model, make, year, color, and other details. Voicing that the same wasn’t done for slaves is downright disrespectful. Granted, a slave’s name was not always mentioned on documents, but even in that scenario, their ages and/or sexes were mentioned or perhaps even that they were children of another slave. Based upon this quote by Dr. Gates in this ESPN the Magazine story published on September 26, I’m not altogether sure the error was made by the writers. Well, I’ve seen it A LOT (see photo above (1). (For examples of how I traced them, click here, here, and here). What type of comeback do you have for that? I’ve got nothing. This “nameless” comment incensed me just as much as hearing “slaves did not marry” from a researcher interviewed in an episode on season one. Apparently, millions are jumping the broom just because its cute whenever they get married. I digress. Another misleading writing/voice over presentation occurred during the Jeter story. Earlier in the program, it was suggested that Jeter’s 2x great grandfather, Green Jeter, was the son of his former slaveholder, James Williamson Jeter, merely because his racial designation was marked as Mulatto on the 1870 US Census and because he purchased land near the former slaveholder’s land. Later in the episode, this was “cleaned up” by presenting a bit of DNA research, but you had to make until almost the end of the episode to see it. Without getting into too much debate over the term “race,” I’ll just go on record to say this. Just because a person was marked on the census as Mulatto does not automatically mean that they are the direct product of an African and European relationship. It’s VERY possible that the relationship that created this bi-racial designation took place a generation or more before the person was born and as a result, they reflect the physical features of both racial designations. For example, my own grandmother (pictured left) was marked as Mulatto on a census (2, see below). I don’t think my grandmother has EVER checked more than one box for her race in her life, but based on the fact that her mother/my great grandmother appeared Mulatto, all of her children were marked as such. In fact, my great grandmother’s parents/my 2x great grandparents weren’t bi-racial either. The bi-racial relationship came into play at least two generations before my great grandmother (or with my 3x great grandparents). Making a leap to a conclusion such as thus is extremely risky when one is doing African American genealogy research. It can altogether lead a researcher down the wrong path for a long time before they determine it’s wrong and that “M” notation could have been subjective to the census enumerator’s interpretation. It’s also very telling. Many of the folks I encounter doing research on African American genealogy are overly concerned about how “white” or “Native American” they are and sometimes discount the story of their African American ancestors just to get to the alleged “white” or “Native American” sides of their family. In my opinion, the very fact that this was done on a show of this magnitude, and how quickly it was done, signals a “jumping of the shark” for the series to me. What About the Rest of Green Jeter’s Life? One opportunity that I see may have been overlooked in the final cut was to take more time to talk about the life of Green Jeter. So much time was spent proving that he was the descendant of someone “white” (and hence jumping the shark) and less on the life he lead post slavery. 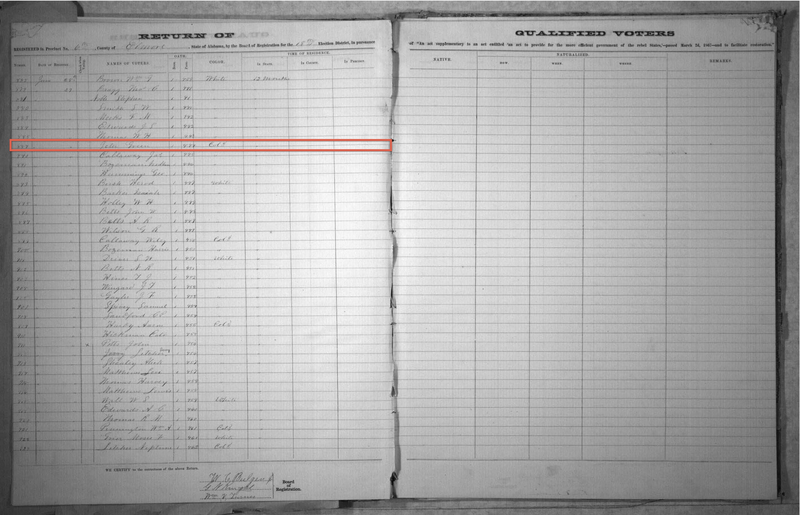 A HUGE fact that was not mentioned in the final cut was the fact that Green was a registered voter (3, see below) three years BEFORE the 15th Amendment was ratified by Congress. 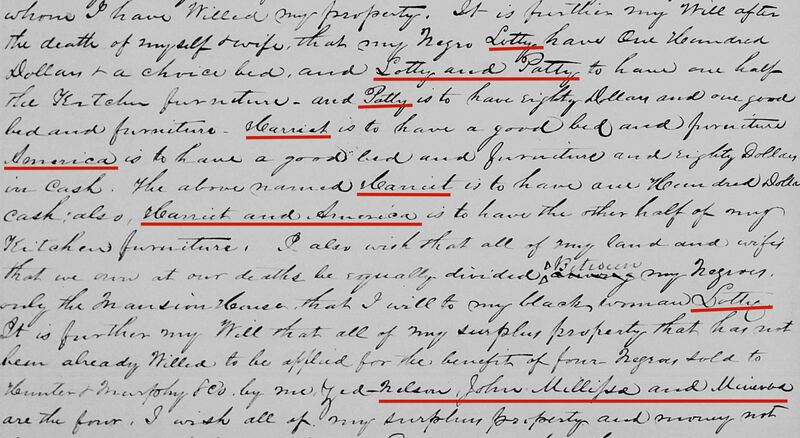 This is a REALLY big deal, especially considering that just five years earlier, Green was likely living as an enslaved man with no human rights as dictated by the law of the U.S.
As indicated in the final cut, Green did attain $250 worth of personal estate as evidenced by his 1870 US Census record too. This is the equivalent of $4,539.49 (4) in the year 2013! Douglass became the first African-American to win a vote in presidential balloting at a major party convention. He received one vote.” (6) I’m not sure why they didn’t mention this on the show, but it’s definitely something that’s pretty awesome to me. In all, Green wasn’t just a slave who was fathered by a white slaveholder. His life had MUCH more to say than that and to minimize it does a big injustice to anyone with ancestors who were both formerly enslaved and descendants of slaveholders. I totally understand that there’s only so much time during each episode for each guest and the most compelling stories and reactions are what make the final cut. On the other hand, perhaps more care can be taken regarding how things are shared and presented. “ADAH: Alabama 1867 Voter Registration Records Database, Search Page.”Alabama Department of Archives and History. N.p., 17 Feb. 2012. Web. 30 Sept. 2014. <http://www.archives.alabama.gov/voterreg/search.cfm>. Green Jeter, African-American, Elmore County, Precinct 6, District 18. 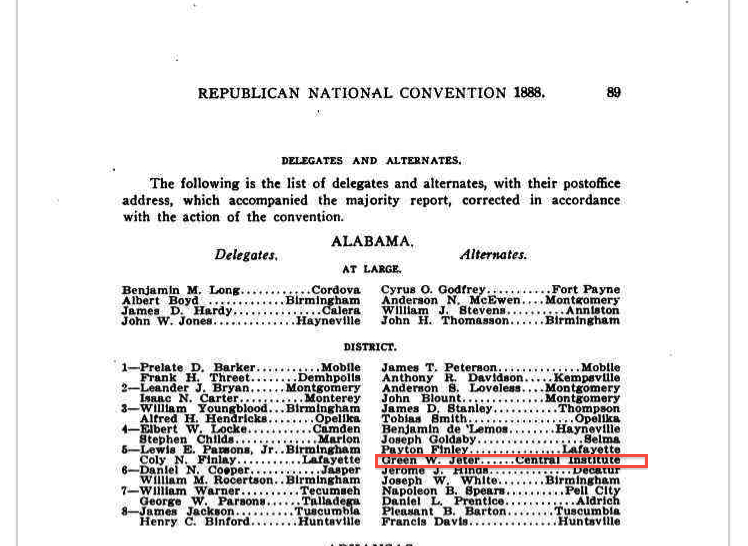 Official Proceedings of the Republican National Convention, Held at Chicago June 3, 4, 5, 6, 1884, Page 89, Green W. Jeter, Central Institute, accessed September 30, 2014 via Google Books. And didn’t the slave census he referred to for Green list a 6 year old FEMALE?? Or are my old eyes fooling me again? Excellent work, Nicka! Those of us who live and breathe this work on a very personal (and careful) level know that we can’t jump to immediate conclusions, as we saw done on the show. Thanks for taking the time to further the research! The questions about the 6-year old female morphing into an adult male remind me that my (Caucasian, German-American) three-year old father and his ten-month old brother are both enumerated as female in the 1900 census in Hammond, Lake, Indiana. As a further example of the lack of concern with accuracy, the younger brother was shown as an alien, born in Germany, in the 1920 census. Enumerators were paid by the number of entries, not their precision. Pingback: There's No Wizardry or Voodoo in Tracing Slaveholders - who is nicka smith?